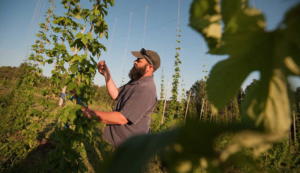 Bev-Craft CEO Tim Nelson and Bev-Craft Brewer Frank Kaszuba bring along Lori Melton of Harbor Hops to discuss hop farming in the Lake Superior region. Harbor Hops is located in Two Harbors, Minn., just 25 miles north of Duluth. They distribute their hops to area breweries, home brewers, and also sell rhizomes. The Bev-Craft Beer Break is a bi-monthly radio spot on KQDS radio in Duluth, Minn. that draws on the expertise of Bev-Craft to explore independent craft brewing at the head of Lake Superior.